I am excited to announce I will be at the Beaumont Horse Trials June 4 and 5. 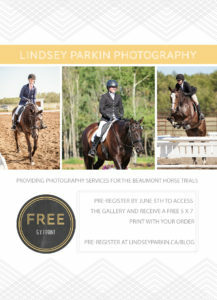 To pre-register and receive notification once the gallery goes live, visit http://lindseyparkinphotography.shootproof.com/gallery/beaumonthorsetrials/ and enter your email address. Want a free 5 x 7 print with your order? Pre-register prior to June 5. I’m looking forward to spending the weekend with all of the horses and riders and capturing all of the action!